Our partner school Colón, was founded in 1952 and has developed into one of Germany’s leading language institutes with 18 language courses on offer. Colón is situated in the Colonnaden district of the city, in a quiet pedestrian zone. The most interesting feature of the school is the specialist language bookstore, the International Bookshop Colón, where modern course materials and foreign language literature are available for purchase. The school has a special range of CD-Rom courses where students can test themselves and continue their language study in their free time. Alongside the wide range of German language courses, the school regularly organises a variety of enjoyable extra-curricular activities to make the language holiday that little bit more enjoyable. Alternatively many students enjoy exploring the city by themselves or with a group of friends or fellow classmates. There is so much to see and do in Munich, that fitting it all in is quite a challenge! For those who like to combine their German course with sailing lessons, StudyTravel can put you in contact with a sailing school who organises lessons at the Alster, a right tributary of the Elbe river. An intensive German course of 25 lessons in Hamburg is an ideal way to learn the language quickly and effeciently. Involving small class sizes with a maximum of 15 students per class, the course covers every aspect of the German language with particular emphasis on communication. The course takes place from Monday to Friday from 08:50 to 13:00. The minum stay is 4 weeks. Note that when you book accommodation in the residence, you can only arrive on Friday between 12:00 and 18:00. The price indicated is for an airport transfer upon arrival at airport Hamburg-Fuhlsbuettel or Hamburg-Lübeck. A transfer from the bus or train station of Hamburg costs € 90 per way. Course material is not included in the price and costs depend on your level (approx. € 31 - 60). The intensive course in the afternoon takes place from Monday to Friday from 13.30 to 17.45. The combined German course in Hamburg consists of an intensive German course with 20 group lessons per week with an additional 5 one-to-lessons with a private native-speaking teacher. The one-to-one lessons are adapted to suit the student and there are often a variety of topics in which to study. The combined morning course takes place from Monday to Friday from 08.00 to 13.00. The course takes place from Monday to Friday from 13.30 - 18.45. The one-to-one german course in Hamburg is specially designed to suit the needs and wants of the student. Involving private lessons with a native-speaking teacher, the student can choose particular topics of interest to study or an aspect of the langauge that has been troubling them. The Exam Preparation course in Hamburg combines 15 lessons of General German with 10 lessons of TestDaF preparation per week. Lessons take place from Monday to Friday, from 08:50 to 13:00. The Test of German as a Foreign Language (TestDaF) is a central, standardized language test at the level of C1. It entitles foreign students to study at a German university or college (Fachhochschule). If you take a course for 4 weeks or longer you can choose for accommodation in a shared apartment. You share the apartment with Germans. Stay in a shared apartment is in a single room and you share the kichen, living room and bathroom with the others. Bed sheets and towels will be proved. Check-In is Sunday before the course starts and check-out on saturday after the course has ended. 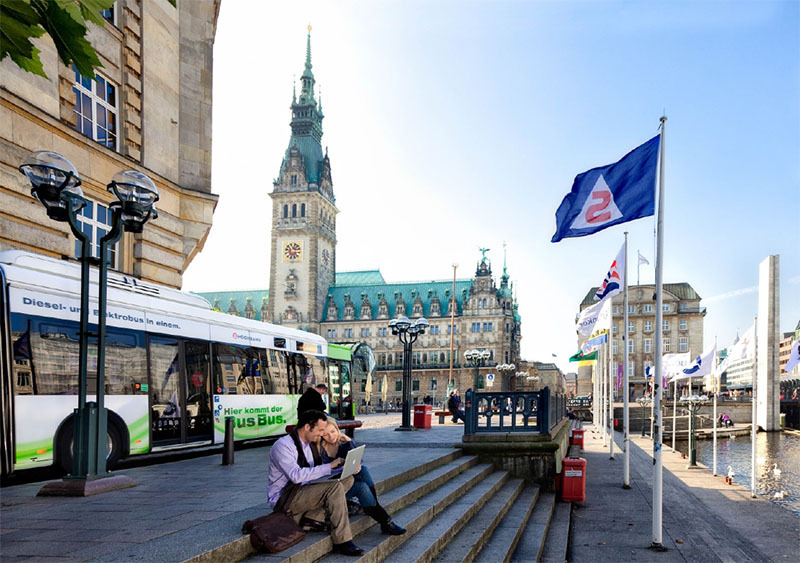 Staying with a host family in Hamburg is an excellent way of practising German at every opportunity and you will become fully immersed in the local way of life. All host families are specially selected by the school for living quality, position in relation to the school and for friendliness. The school residence is a great place for meeting new people and making friends, where you can practise what you have learned at school. The residence is located quite close to the school, is shared accommodation with a kitchen, bathroom and lounge and is self-catered (no meals). who would like to learn German and live in Hamburg for a longer period. The apartment house consists of studios is located in the city centre and has recently opened. The studio apartments are furnished and have a pantry area and a bathroom. There is a parking space for bicycles.